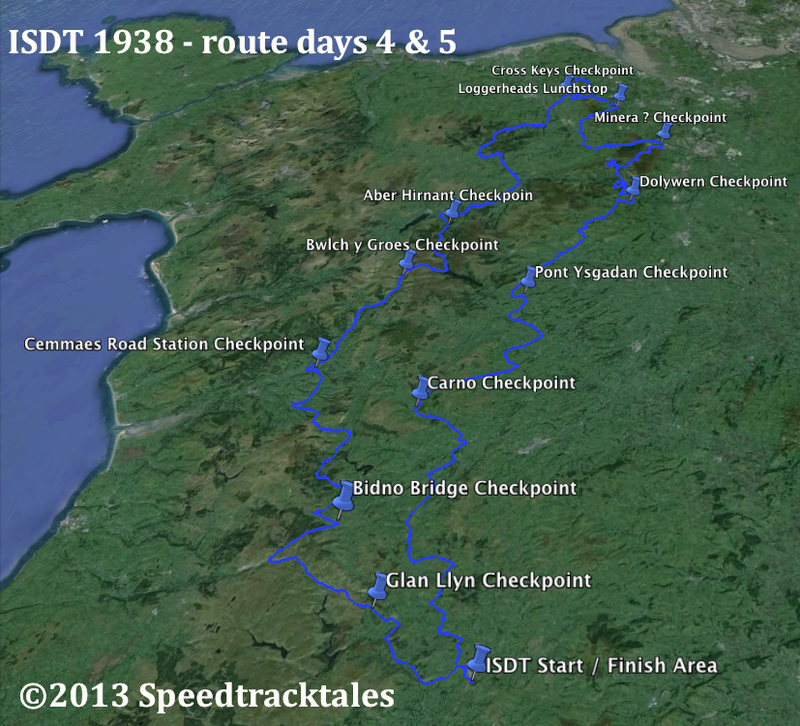 When I picked up on restoring Taff’s original Speedtracktales site, I saw the clear evidence that ISDT had once visited North Wales, not only once but a few times and these old guys maybe were no so crazy, indeed it appears to have not only made a number of visits to the Bwlch y Groes and Allt y Bady in Llangollen but found its way up into the wastes of Denbighshire and Flintshire on more than one occasion. As digital mapping and cartography are part of my professional skills I immediately realised that at some point the mapping the ISDT would become an essential part of the project in saving for the future, the memory of the event. Doing this would be an ideal project for the next few winters. This post concludes that it’s not going to be an easy task, first of all the maps and knowledge of where the route went that are still available are limited.. 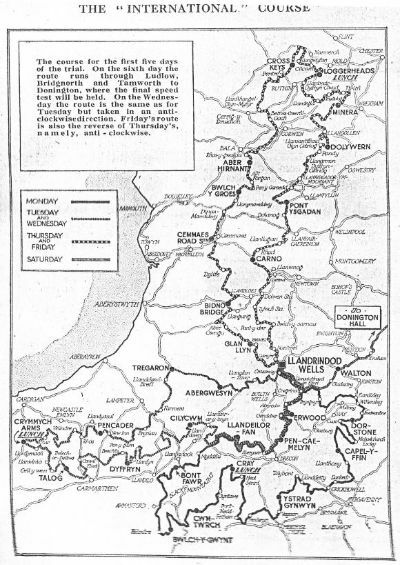 I am sure no Clerks of the Course remain alive, so the only reliable record is the maps which either appear in motorcycle magazine articles such as the example above, or those provided in the programmes, these are usually not much better than an A5 or A4 plan covering all of Wales as provided below. They were mainly intended to inform spectators but were never a road book for the competitors who relied on road marking and time cards and so did not need to be accurate. So details of the actual roads and tracks other than where they followed significant roads is often limited, although these maps do appear to have some cartographic truth about them so appear to have been an honest attempt to recreate the route, possibly created by tracing rather than simply a diagramatic explanation. 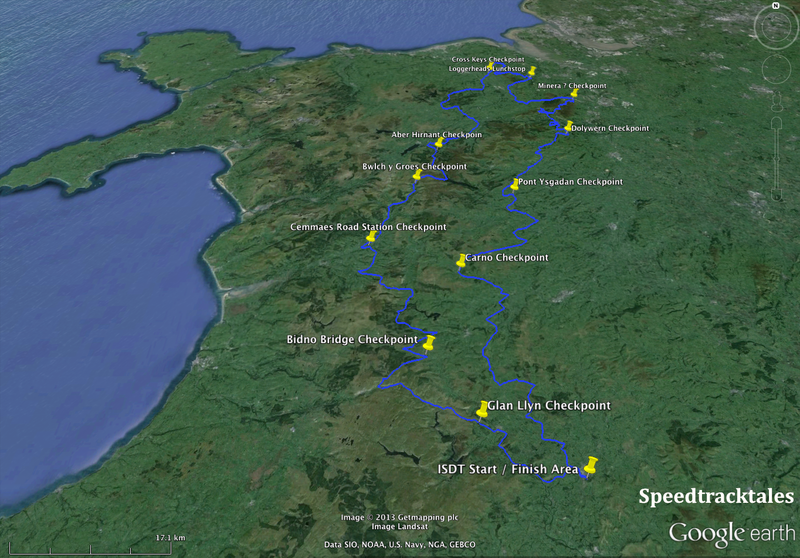 I started the quest this weekend with the ISDT 1938 and chose to commence with days 4 and 5 which were the clockwise and anti-clockwise routes that passed through the mid and north Wales countryside I am most familiar with. 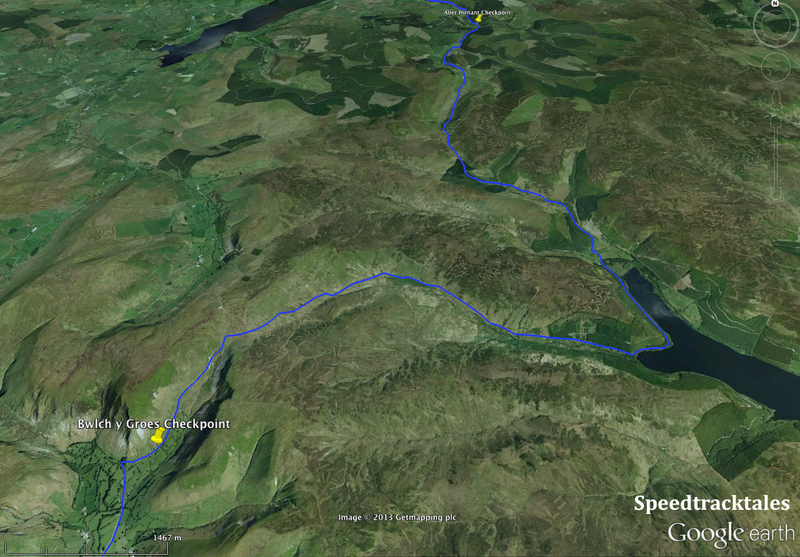 So I now have two maps of similar origin showing the course. The greater scale being the programme map, although it is has the minimum of details, the newspaper map although smaller had some key features that would be essential in making sense of the maps. In terms of creating the line of the route I decided to use Google Earth which although supplied with fairly crude digitising tools, has access to a good map base. Also I have the resources to drop the latest OS 1:50000 and 1:10000 mapping into the map window, it contains height data and the data format it uses makes it easy to share a file or to convert to be input into a GPS device. The first and most obvious features that are known and simplest to plot are the daily checkpoints. From the map it was clear one of the names were already known to me. Carno, which is currently the start venue of an enduro that I currently am the Clerk of Course of and is the only remaining truly open country enduro left running in the UK, the Powys Enduro run by the Mid Wales Trail Riders Association. 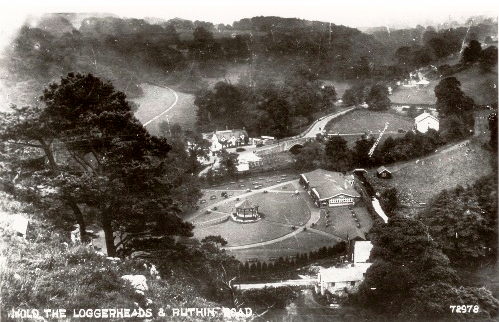 Other places were familiar from various activities including cycling and sunday drives with the family as a child. Although not able to pin point the location to the actual spot for every checkpoint I can get to guess within a few hundred meters where they were. The only difficult one was named the Cross Keyes which must be an Inn. I did know of a Cross Keyes in Ruthin that was not that far from a part of the route so made an assumption it was there in Ruthin. I then strung together a line, like a dot to dot drawing, sketched to refect the general shape and location of the route as it passed between checks. Comparing that data over fairly crude OS 1:250000 data seemed to show a lot of similarity with the modern highway network which gave me a kind of general network of current roads I could edit the hand drawn data to resemble the programme maps but relating to real highways on the ground. 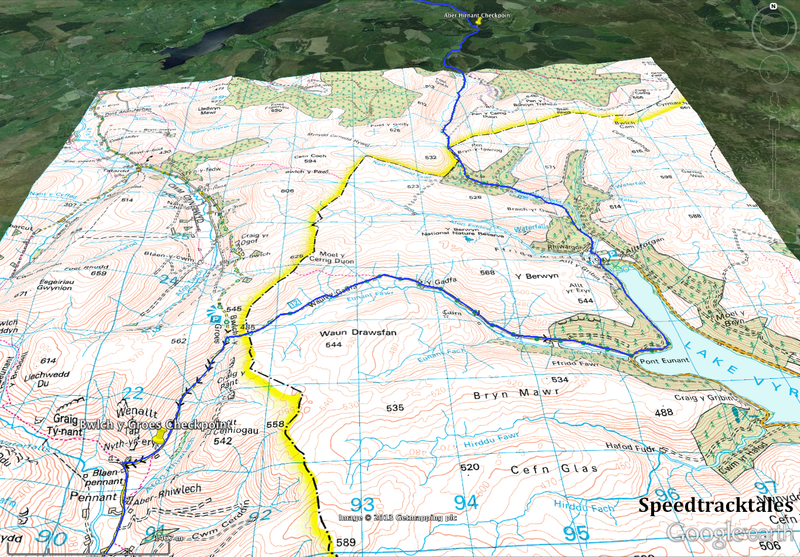 I then refined those lines using more familiar OS 1:50000 maps to locate the likely route. This gave me slightly more confidence the route was correct and in places it is a familiar route and I am certain that the route could lie nowhere else. 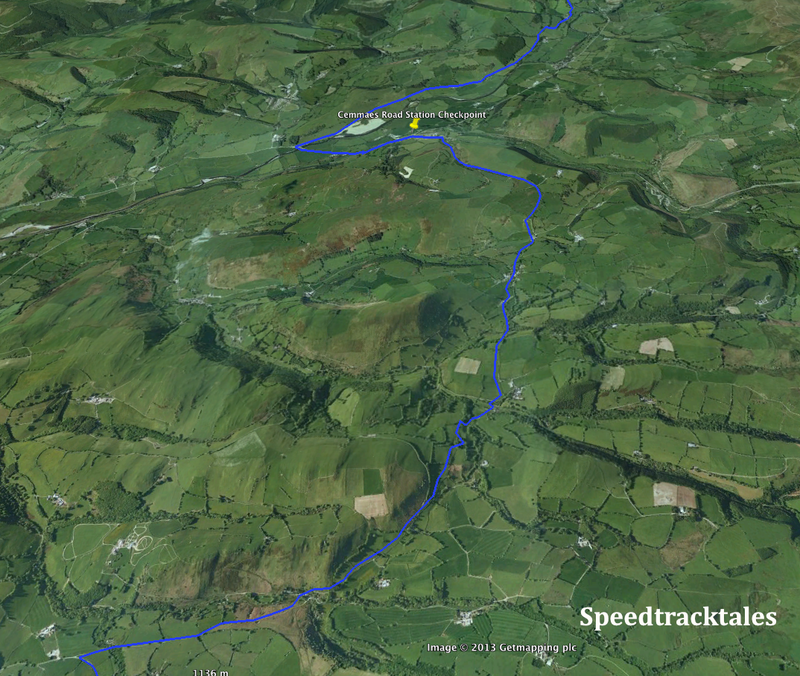 It was fairly easy to map the section of the route running up from Bidno Bridge to Cemmaes Road Station, the earlier part passes through Staylittle and then heads towards Darowen where it picks up the modern course of the Powys Enduro and a couple of what remain even today as pretty ferocious sections of track that run up a bed of continuous polished rock wetted by springs and streams. The route heads up towards Bwlch y Groes along the valley of the Afon Dyfi passing Dyfi Forest home of the Dyfi Enduro, a round of the British National championships and run by MWTRA also. The problem in getting the route finished lay with the northern most section. 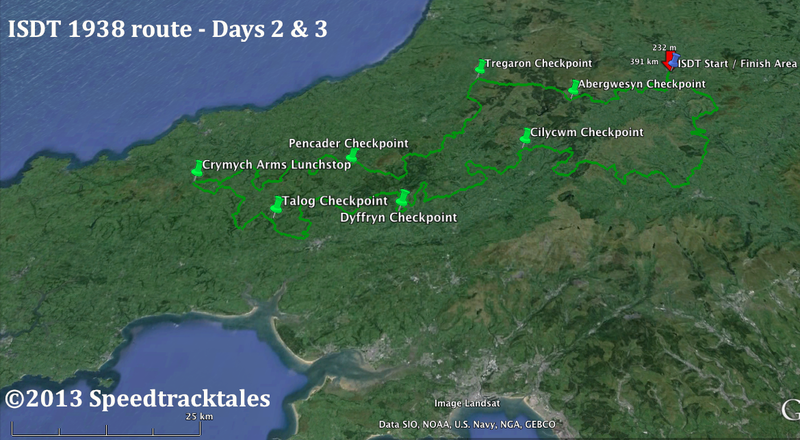 Although most familiar with the routes of the area, if the checkpoint was at the Cross Keyes in Ruthin and the map as accurate as I thought it might be, then much of that section did was not following routes that made any sense nor did they look like they were the route drawn on the map. It was obvious this was not the right Cross Keyes, a quick Google Search gave me only two pubs of that name in the region, I had never heard of any other pubs called the Cross Keyes. Pubs sometimes changed names and from time to time even were close. 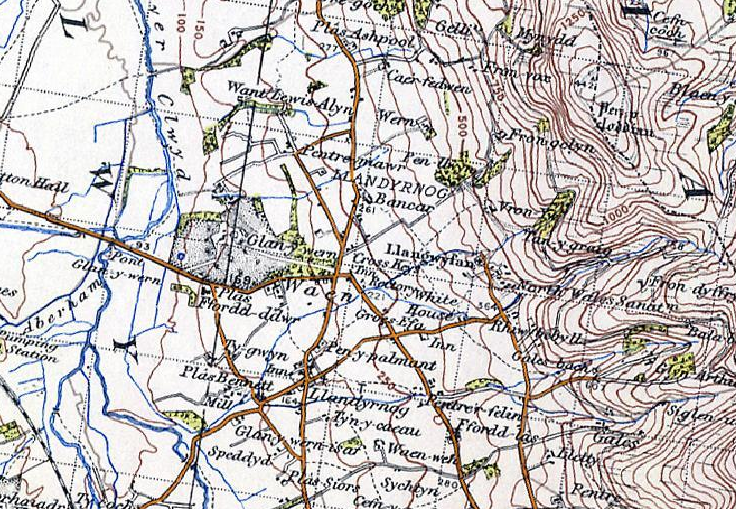 The lines on the magazine map, which named the main places along the route, placed the pub, in my view, to the north east of Ruthin near a village called Llandyrnog. 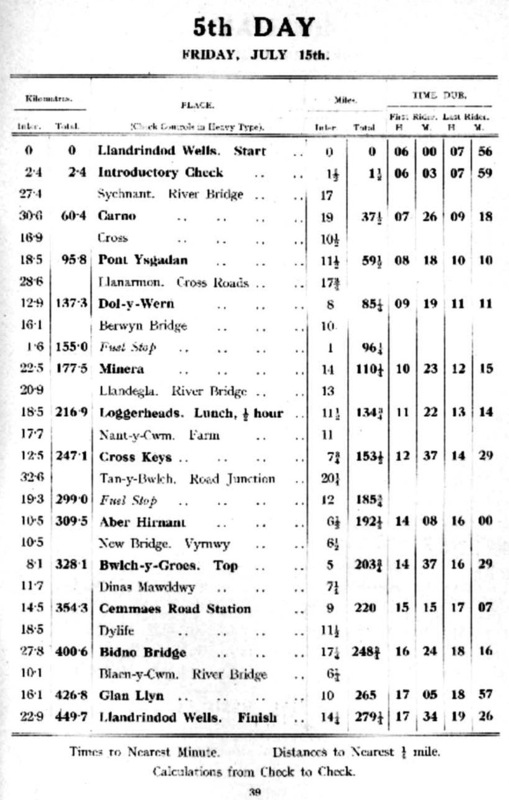 In this instance the small newspaper map which had the locations of local villages made more sense than the larger programme map and confirmed the point was well to the North West of the lunchstop at Loggerheads which it could not be if it was at Ruthin. This village has two pubs with the same landlord, who I knew and they were the White Horse and Golden Lion which had never changed name nor was I familiar with any ex pubs of that name. I redrew the map to presume the pub was in Llandyrnog and this time the route made a lot more sense and even passed the very same hedge that my old timers had talked about. Redrawing the route i did a number of Google searches on Cross Keys Inn to see if I could sake it out of the bits and binary of the internet but nothing came forward. I called a few people who were equally bewildered until one typed Cross Keys without the word Inn into Google and suddenly there was an answer on Zoopla the property site, which is now a small farm house set on a lane outside of Llandyrnog called Cross Keys, the bonus was it sat right at the side of the obvious route. A quick trip to the Vision of Britain website was able to summon up a colour 1″ OS map from the 1920’s which confirms the location of the Inn as being the same as the checkpoint on the map. So we had the final check pinned on the map and for the first time since 1938 I have the honour of reproducing here the map of the 4th (clockwise) and 5th (anti-clockwise) days of the ISDT 1938. 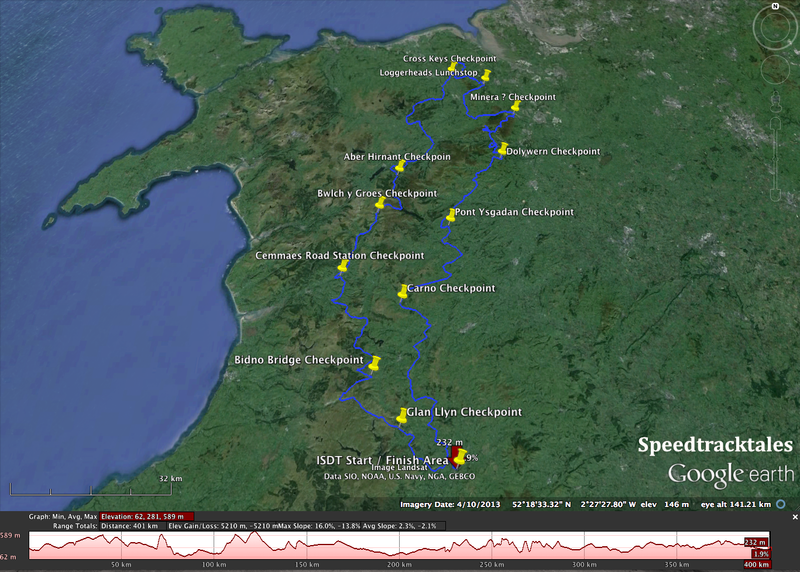 One of the benefits of working with Google earth is the background height data enables a quick profile of any route to be produced on the fly, and the next image shows the profile of the 401km, total climbing of 5000m that the route of the ISDT 1938 took. 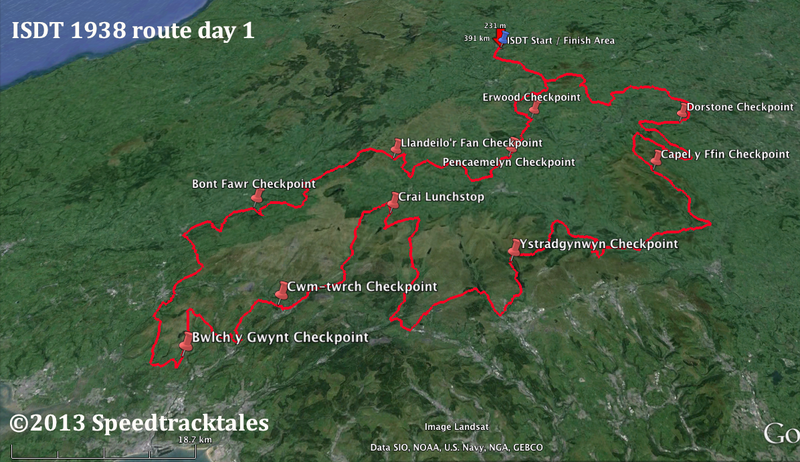 Part 2 Update… inspired by my original work, and with much thanks, a member of WTRA / West Glos MCC familiar with the South Wales area has strung together maps for days 1, 2 and 3, here is the merged data for Day 1, 2 and 3 with our original day 4 & 5 map. 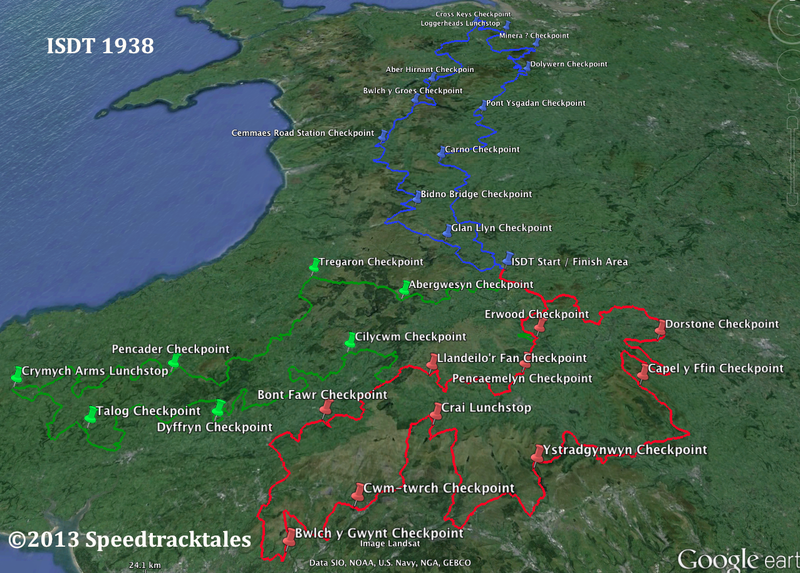 i’ve had a go at mapping the 1938 Routes from the Map you provided on the ‘Where did it go’ page. If you give me an email to send to I’ll pass you the GPX files. That tracing is pretty accurate, as you say, It really does map nicely to real roads/lanes/UCRs. 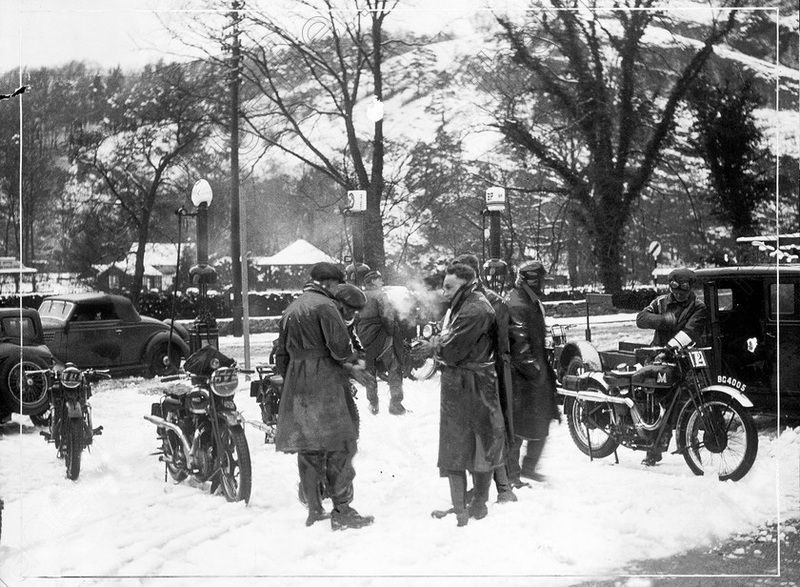 It is so hard nowadays to believe that the identified roads were ever tough enough to provide a challenge other than by raising the speed schedule or by providing proper Welsh weather. Thank goodness for some fantastic photos on your site from the period showing the surface to be somewhat different to today… perhaps it was a bit tough. We own Cross Keys in Llandyrnog and can say that according to the records, it ceased to be a pub in 1823, if that helps. I have mapped the western end of Day 2/3 on to the 50 thou Cardigan sheet (145) to the best of my ability and ridden most of it, stopping for lunch at the Crymch Arms. 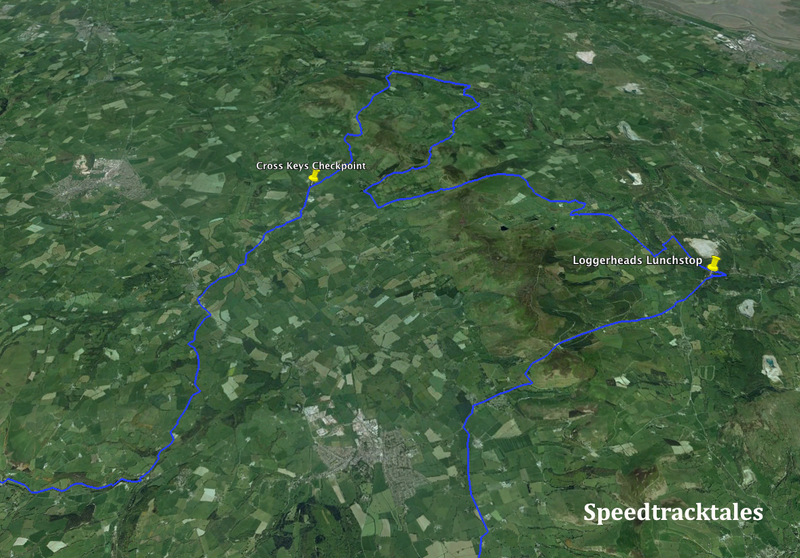 A friend used to live near the route at Capel Ewan but has now moved to Cenarth. It is a lovely part of the world and I would love to ride the whole route! I intend to run a Greeves back to back with a Royal Enfield Bullet (if I can ever find a decent picture or two of a 1960-on model for details!) The Greeves is easy as the engineering drawings of most of the special parts still exist. Whoops, sorry, 1938! I had just been reading about it but forgot to make that clear!